Let’s cut right to the chase. Don’t limit boys’ reading choices as it may lead to reading problems such as loss of motivation and loss of literacy development. 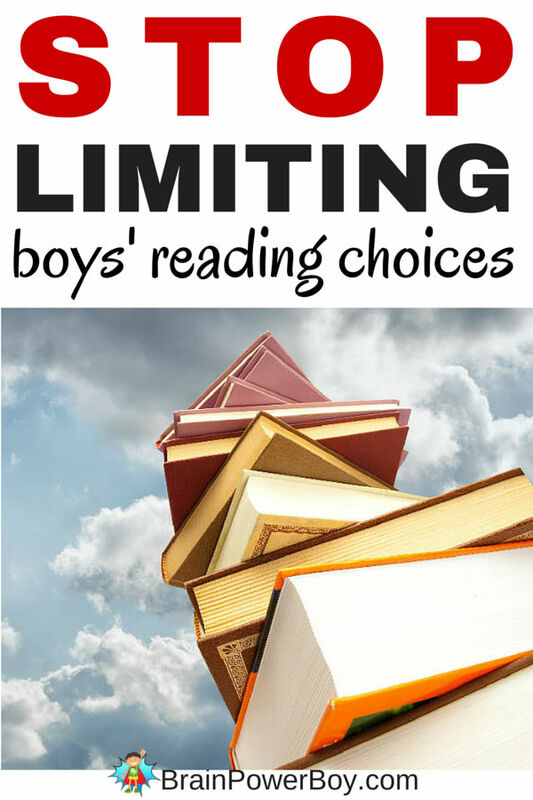 Today we are going to take a look at the reasons limiting a boy’s reading choices is a bad idea and why you need to stop. I will tell you a story about our trip to the library and explain what happens when unreasonable limits interfere with a boy’s desire to read. When I see people limit boys’ reading choices and I think about all the problems this causes it really bothers me because it has a big impact on boys’ learning. Reading is wonderful. It is a joy. It provides a lot of important information and much of our learning involves some sort of reading. Not only is it enjoyable, it is also very valuable and can make a huge difference in a boy’s life. So I was just a tad upset the other day when we went to the library and this happened . . .
My son and I went to the library the other day and there was a woman there with three young boys. I would say they were around four, seven and nine/ten in age. Each boy was so excited to be at the library. They were interested in a lot of different books and were talking in hurried, loud voices about what they were going to get. They were asking the librarian for help finding the books they wanted. There is an excitement to picking out your own special book and slowly opening the cover. Limiting what they read takes this away. Boys who choose their own books will read more books. Period. Then the mother stepped in and put limits on the number of books and what books they could check out. Boo hiss. I guess I can understand reasonable limits – well, not really – and these limits did not seem reasonable to me. Two books. Really? Two. Why two? That doesn’t even seem to be enough books to get through a week. I have a hard time understanding choosing to limit the number of books a child is allowed to check out from the library. I guess if they get lost or if you incur fines that would be an issue but both of those things can easily be remedied by keeping track of your checkouts. It is not respectful to deny your boy the joy of reading by limiting his choices. The more a boy reads the better he gets at reading. The more books a boy reads the more vocabulary he is exposed to. It doesn’t matter if he reads comic books, non-fiction books, or magazines—he is learning new words. A boy may find his passion, his life’s calling, while browsing through a wide variety of books. Unfortunately, it went on and on. She yelled (really yelled) at him across the library and then, when he said he had a chapter book at home she said “then why did we even come here tonight?” Ouch. Exposing boys to books and print on a regular basis is imperative. They need to be around books a lot in order to feel comfortable with them and want to pick them up. Allowing a boy to make his own choices shows that you trust his judgment and that you value his decisions. With all the information out there about the crisis in boys’ learning and especially in boys’ reading I was saddened to see this happening. The boy wanted , really wanted, to read. I wish this was an isolated incident but unfortunately I see it all too often. Letting boys pick the books they want to read means they may actually read them. Reading helps with speech, communication, comprehension, writing, grammar, and so much more. You don’t necessarily know which book is going to work the best—but your boy might. 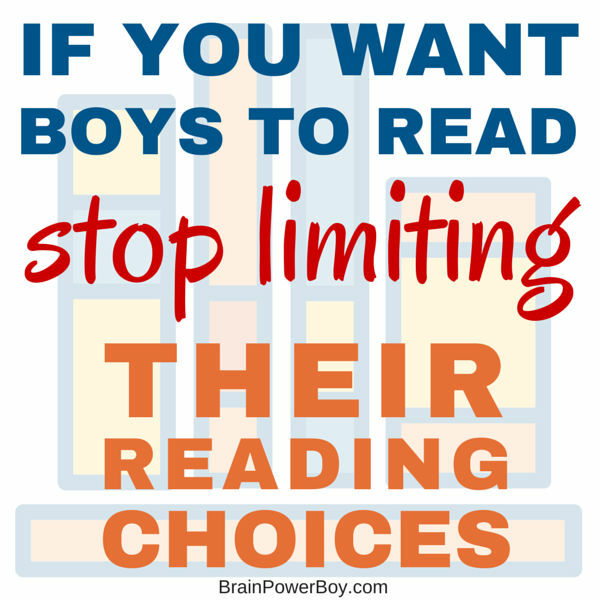 Limiting a boy’s reading choices could lead to him hating reading. If you have a boy who hates reading please see What to do if Your Boy Hates Reading to turn that around as soon as possible. In this same study they say that “some books may be very difficult to read, but because they are so interesting students decide to read them anyway” (Tompkins & McGee, 1993, p. 278).” Being able to choose may actually lead them to read books that you would never pick for them but that will allow them to learn a lot. In conclusion, reading is a personal experience. It really is. The whole point is to get boys to read because reading can be helpful and valuable to boys. Don’t make reading into something a boy “has” to do. Reading is enjoyable and fun, it is wonderfully delightful. Letting him choose his own reading materials will get him reading more and that is a very good thing. See also: The Five Finger Rule and Why it is Bad for Boys. If you liked this article, please use the sharing buttons below to share it with others. Thanks! Love this! I heard Mac Barnett (author of Battle Bunny, Extra Yarn, etc.) speak very passionately about this subject at a children’s writers’ and illustrators’ conference (more from the point of view of write those books that boys — and girls — would want to pick up and read, that reflect the actual lives they live rather than the ones we wish every child could live it). One of his main points was along the lines of if we keep censoring issues that matter to kids from the books they read, while all other forms of media are not censoring them, then books will become more or less irrelevant to children trying to make sense of this strange world they’re growing up in. It really changed my way of thinking, both about my own work writing for children and about what I read to my son (and will let him read when he starts). Interesting information about Mac Barnett. I will have to see if I can find a transcript of his speech. For a long time now I have been concerned about many issues surrounding boys’ reading. While I was speaking more in general about limits, I can see his point. I appreciate you stopping by and leaving a comment on this post. You made my day! 1) Any more than 3 books and they would lose them. End of story. 2) If it wasn’t good writing, they weren’t getting them. I didn’t care what the topic was, but it had to be decent writing, not baby talk — you know there are a lot of books like that out there. 4) Sometimes they had a specific topic to choose from, because it matched their summer learning. Last year, for example, my daughter had to choose books about Greek history and Greek myths. I am all for letting kids read what they want. As I said, I have a giant library of my own. However, sometimes there are also very valid reasons to restrict their library choices or their choices at the bookstore. Hi Sarah, Thanks so much for reading the post and commenting on it. Each family is different. We have taken out over 75 books at a time and never lost one. All books are kept in two places in the house and they always go back there when we are finished with them so I can’t really relate to only getting three or they will be lost. Yes, there are books that I think are, using a Charlotte Mason term, twaddle. However, if my son wanted them, I let him have them. He didn’t start changing because he read them and they made for good conversation about what makes a good story or about what the characters where doing or saying. If a child is in school or in a curriculum based homeschool program and you require specific topics for reading then I guess they Have to read on that topic though I would suggest that they be able to learn that topic in whatever way works best for them, using whatever materials were available, not just books. Everyone does things differently. I will always say do what is best for your family. I believe that restricting can lead to issues down the road. Again, thanks for taking the time to comment. I am always interested to see what others think. Yes, this is exactly why my son is currently immersed in a Pokemon Guide Book. I can not stand anything Pokemon, but he really wanted to check out this book today and he hasn’t put it down all day!! I don’t limit what he gets at the Library, however I do require him to pick 3 books to read to me and the rest can be what interests him. He has the BEST time with his books that interest him, but he has also really enjoyed the readers as well! Our Library allows us to print out a receipt so I always know how many books we have out and I can check them off as I gather them to return. They are supposed to stay on one shelf downstairs, but sometimes my son just can’t put one down at the end of the day and it ends up going to bed with him!! Great story about how boys really get into reading when they follow their interests. We can get receipts from out library as well. I actually just check our accts online on a regular basis. Oh yes–reading in bed, too cute 🙂 My son is a big night-time reader as well so the library books do make their way up there too. Thanks so much for stopping by and leaving a comment. I enjoyed hearing from you. I agree with your comment on respect–children need to feel it and see it. I understand the concerns about content. I have found that my son and I have some of the best and deepest conversations about what our family believes and how we feel it is important to act by seeing certain things in books. What a great article Sheila! The only time we ever limit our boys is if they already have books out, or if we’re walking because books can get heavy lol I always have the rule that they must pick one book we can read together, and as a treat one long book they would like me to read to them, it could be a chapter book, or a non-fiction book, their choice. After that, they’re allowed to choose whatever they want. I love seeing their selections. We make frequent trips to the library, so they are constantly getting fresh material to read. Our library is actually one of 25 in the system, so while there are a ton of books available in the system, our library only stocks so many so we’ve learned to think ahead and request books we know we want to read. I’ve even got my youngest making requests for certain books, so we place a hold on them and then he gets to pick them up when they come in at our library. Oh yes, I know all about trying to carry them all and we have maxed out our cards more than once 🙂 We like having fresh material to read all the time too and use ILL frequently. I love books and reading and our house is already filled to the brim with books for the kiddos. We have books at their level in every room and they love to just go and sit quietly, or bring a book over they want to read. When we go to the library we let them pick out books to bring home and I will never limit that number – well unless the library does! I love that you put the books where they can use them and reach them. We are huge book people and always had shelves my son could access. We did hit library limits more than once but that is all part of the learning as well when it comes down to it. That also appears in some books… My husband took her to the library one day and she picked up a couple of books she wanted to read. It had pictures of trolls. He looked trough the images and there were trolls showing their butts, one was flipping the finger and the language was very offensive and disgusting… He borrowed the book just to show me. I don’t want to have conversations about the difference between what we stand for and what the book shows of imagery and words. I have enough work as it is – doing so for every time she hears it out side lol.. Welcome to the land of “nobody flipping cares”… That’s what my mom called this country when she first brought me… It has only gotten worse.. I love books and have done so since I learned to read. I always read something, I always study something. But I do think there are limits, even for boys that find it hard to love to read. I was more talking about how a lot of people think boys should read more and yet they limit what they are allowed to read. By that I meant that some seem to place a high value on chapter books (and I see that a lot) but won’t let a child select a magazine, manual, or non-fiction book instead. I understand what you are saying about language and the trolls 🙂 Your daughter is young and when my son was young I certainly didn’t select things that were offensive. I have to say I never saw books in the children’s section of our libraries quite like you described! As he got older we used examples found in books (or in public for that matter) as ways to have good conversations about what we believe and why we act the way we do.